Born in Tyabb, Woolley wore guernsey #32 in 12 games for Carlton commencing in Season 1918. He kicked 7 goals in Navy Blue. Woolley has tried out at both Melbourne and Essendon in the pre-war Era. He also played for South Yarra and VFA clubs Hawthorn, Northcote and Preston. 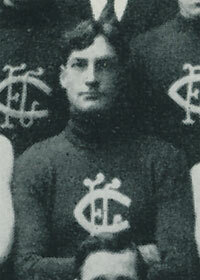 Woolley first played VFL football with Essendon from 1913 to 1914 where he played nine games and booted five goals. Woolley transferred to Melbourne early in 1914 where he managed a further two games and two goals. Woolley passed away on the 20th November, 1957 aged 71. Jack Woolley was a policeman and a runner. "Constable Jack Woolley, who played for the Carlton Football Club last season, will be seen in action again on the track this season. Some years ago, when Russell Watson, the brilliant amateur middle distance champion was training on the Albert ground, Woolley proved a useful factor in Watson's work, for he frequently went out and made the pace for him." Contributors to this page: blueycarlton , Bombasheldon , molsey , tmd1 , Jarusa and admin . Page last modified on Friday 20 of December, 2013 15:34:30 AEDT by blueycarlton. 1997 Rd 14 - Ratts: when the tough get going. 1988 Rd 11 - David Rhys-Jones.